Product code: R152 Categories: Sold Items, Sold Jewellery. 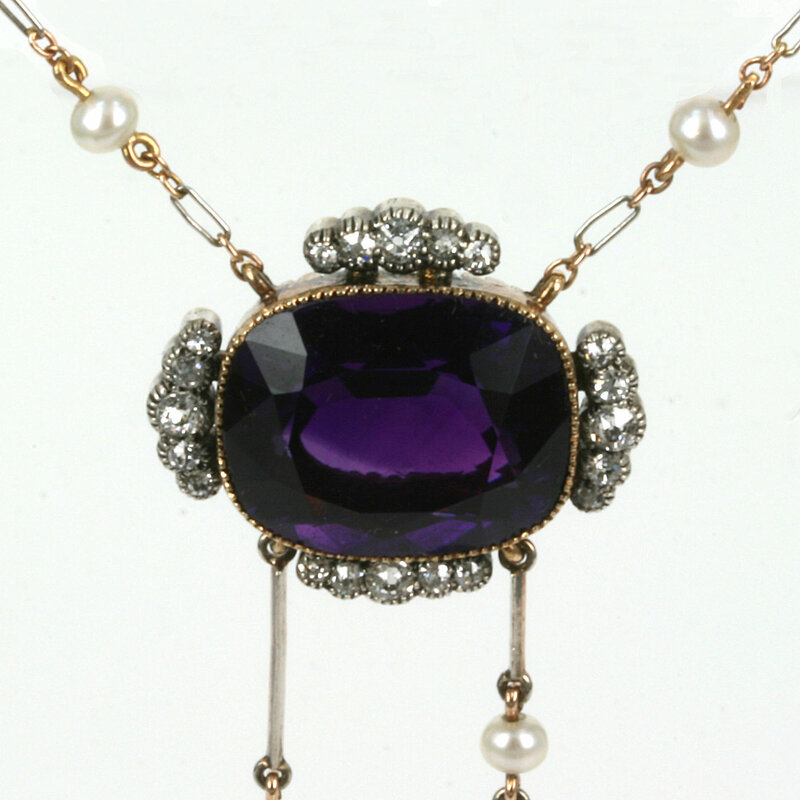 There is no other word to describe this antique negligee pendant other than breathtaking. From the design and style, to the gold and platinum to finishing it with its original box, this piece is truly spectacular. Entirely hand made by Penligton and Batty in the early 1900’s, it was masterfully made in 18ct gold and platinum. A negligee pendant is one that was popular in the Edwardian through to the Art Deco era of having two drop pieces usually of different lengths that can be seen here. Set in the pendant are three amethysts of incredible intensity and likely to have been mined in the Ural mountains of Russian where amethyst if this quality was found. The centre amethyst measures 12.6 carats and the two others total 6.1 carats and all are matched perfectly for colour and clarity. Surrounding the centre amethyst are a total of 20 European cut diamonds that graduate in size and total 0.40 carats and add such an elegant amount of sparkle without detracting from the amethysts and indeed the piece itself. From the top of the centre amethyst to the lowest amethyst, this distance measures 6.1cm in length and to the shorter one 5cm in length and the centre amethyst measures 2.3cm across from one side with the diamonds to the other side. Laid out from end to end the chain measures 45cm and is made in gold and platinum and then set with 4 natural pearls. Antique jewellery boxes always have so much charm in themselves and this fitted box is certainly no exception. This is truly a spectacular example of Edwardian jewellery at its finest and just shows the quality of craftsmanship that is often lost in many pieces of jewellery today.